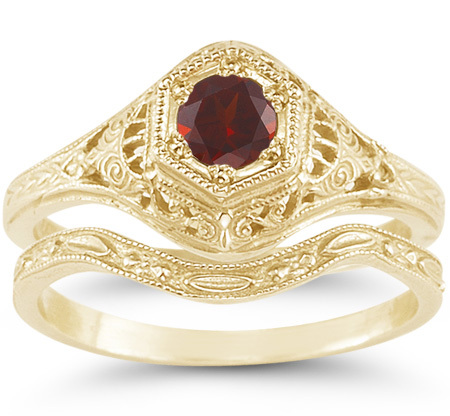 The warm color of 14K yellow gold combines with a deep, maroon color of an AA rated garnet gemstone in this 1800s period style red garnet bridal wedding and engagement ring from Apples of Gold Jewelry. Modeled as an exact replica of the original ring set from the 1800's this antique style bridal set, set in 14K yellow gold, was made using jewelry making pieces that created the original rings. The deep red garnet is a beautiful stone, and the 4mm size makes it the perfect addition to your collection. We guarantee our 1800s Period Style Red Garnet Bridal Wedding and Engagement Ring Set in 14K Yellow Gold to be high quality, authentic jewelry, as described above.